December 19, 2017 - Like us now! Bezel — recognize this word? This word represents the most prominent visual feature which is getting the ax by smartphone manufacturers this year. With more and more flagships coming out with nearly bezel-less displays, how could Huawei’s newest flagship stay off the wagon? Huawei Mate 10 Pro comes with a near edge to edge display and some impressive specs. Let’s go through each aspect of the phone and decide if it’s worth the 87,999 Pakistani Rupees price tag that Huawei has slapped on it. Corning Gorilla Glass (unspecified version) protection on both front and back of the device. As is the case with previous iterations of Huawei’s flagship phones, the unboxing experience is great. Initially, you are greeted with a graceful black box which is much larger than what most phones come in. There is minimal branding on the front and it is super clean to look at. 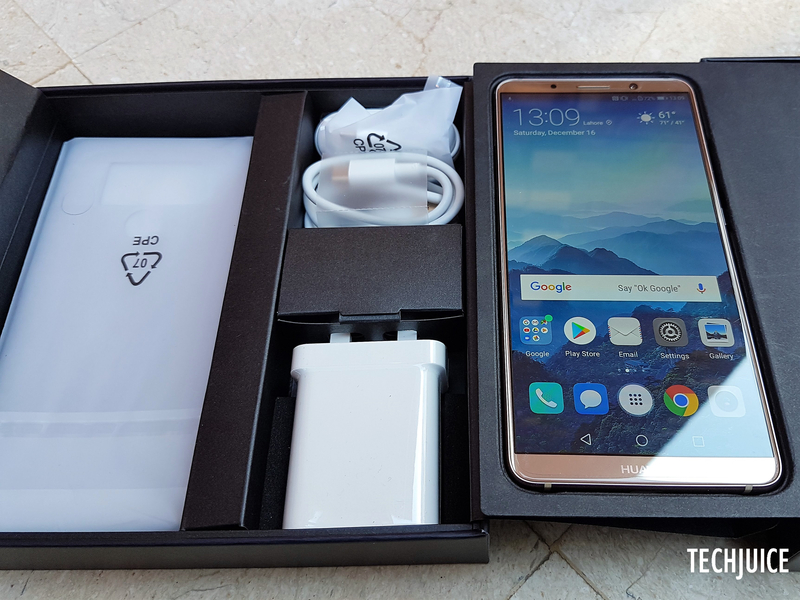 Upon opening the box, the first thing you see is the gorgeous phone sitting on top, separated by the rest of the accessories with a black separater matching the outer box in both color and grace. Upon lifting the separater, you get access to rest of the accessories, each tucked neatly in its own compartment. There’s also a screen protector which Huawei provides along with the phone but it is pre-applied, so one less thing for you to worry about. 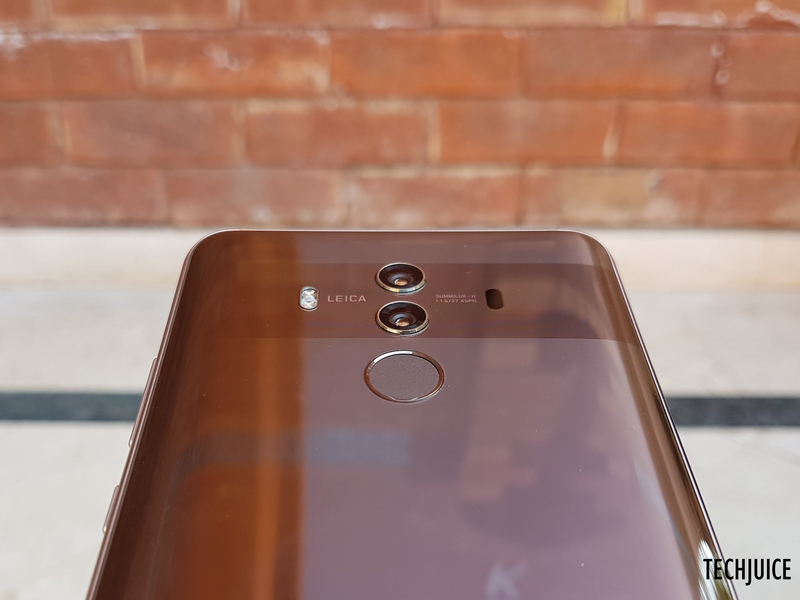 Following the latest market trend, Huawei has also decided to go with a glass back which looks very premium in the rose gold color of my review unit. Although it looks good, there is one drawback of using a glass back which might trouble some users. Huawei Mate 10 Pro, on both front and back, is a fingerprint magnet. If you want to keep your Mate 10 Pro new and shiny, be sure to keep a microfiber cloth along with you to give it a wipe from time to time. The front of the device is nearly all display (something which will be covered in much more detail in a few moments) with symmetric bezels all around the device. Aside from the cameras and sensors on the top and the Huawei logo at the bottom bezel, the front is completely clean. The back of the device houses the dual cameras on a darker strip of glass which makes the whole setup standout more from the rest of the device. There is a fingerprint sensor right below the dual cameras and it is very easily reachable no matter in which hand you hold the device. The right side of the device houses the volume rockers and the power key. The power button has a different feel to it than the volume rockers so there shouldn’t be any trouble differentiating between the two buttons. All the buttons are tactile and have a nice ring to them. Left side of the device is empty bar the small slot for the SIM and SD card slot. The bottom has the USB-C port and the main loudspeaker. The top of the device only has the noise cancellation mic, along with two antenna bands. Display is the main highlight of the phone, and deservedly so. A 6 inches screen with more than 80 percent screen-to-body ratio is not something which you can ignore while looking at the phone for the first time. 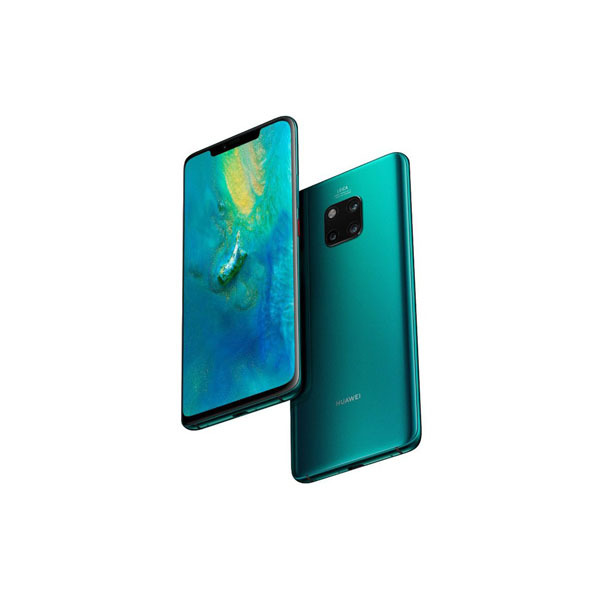 The front of the device is nearly all screen, with symmetrical edges on top and bottom, and left and right to accommodate the front facing camera, earpiece, notification LED, ambient light and proximity sensor. Huawei has used an AMOLED display for Mate 10 Pro, which can be good or bad news, depending on what qualities you want in your display. On one hand, an AMOLED display provides much greater contrast than an IPS panel. The colors look good and it can be much more battery efficient depending on your preference of using darker themes and wallpapers (something which Huawei has taken advantage of in their software). But on the other hand, an AMOLED display has the ever looming disadvantage of getting burned in over the course of time, and with static Android navigation icons present at the bottom of the screen, it seems like only a matter of time before some signs of burn in would start to show up. Keeping all that aside, the display is simply gorgeous to look at. It seems more like a clear piece of display than a phone when you are watching videos or playing game on it. It is an amazing experience, and it is precisely the reason why displays with less bezels are exploding on the market this year. Overall, the display on Huawei Mate 10 Pro is amazing and I have a hard time believing someone would be disappointed with the quality after using it. Huawei Mate 10 Pro comes with the latest version of both Android and EMUI, both bumped up to version 8. 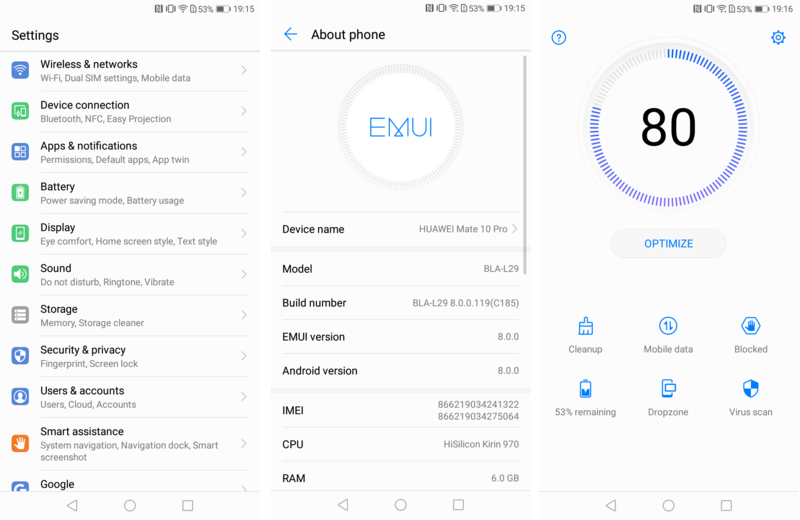 EMUI8 doesn’t come with a lot of visual changes over the previous version, which might be a little off putting for some users as user experience has been one of the weaker points when it comes to EMUI skin. The software experience isn’t bad by any measure though. 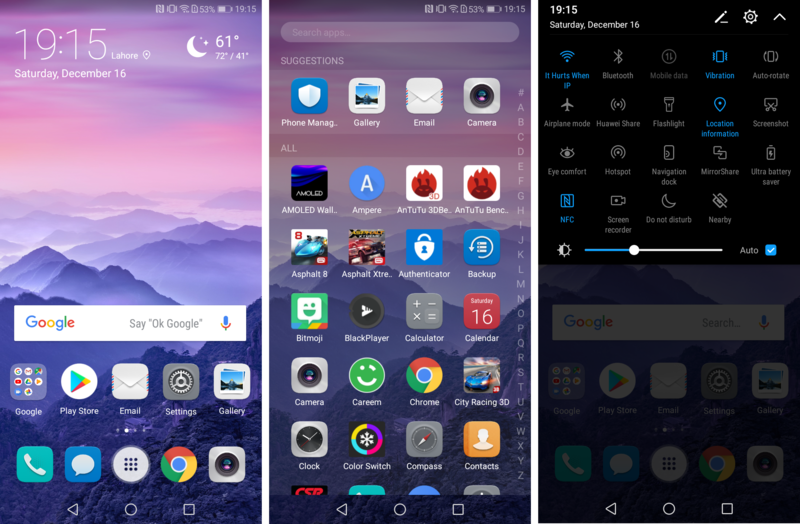 There are some nifty additions to the stock Android like a built-in themes store and a device manager which keeps track of device resources and frees them up regularly to keep it running at the top condition. The device manager scans the whole device and generates a report based on how well the device is currently performing. One click optimize button can then fix all the issues and restore it to optimal condition. There are also a number of very important and useful additions to the software like a display color temperature adjustment tool in the settings. These little additions make the whole experience much more user-friendly. 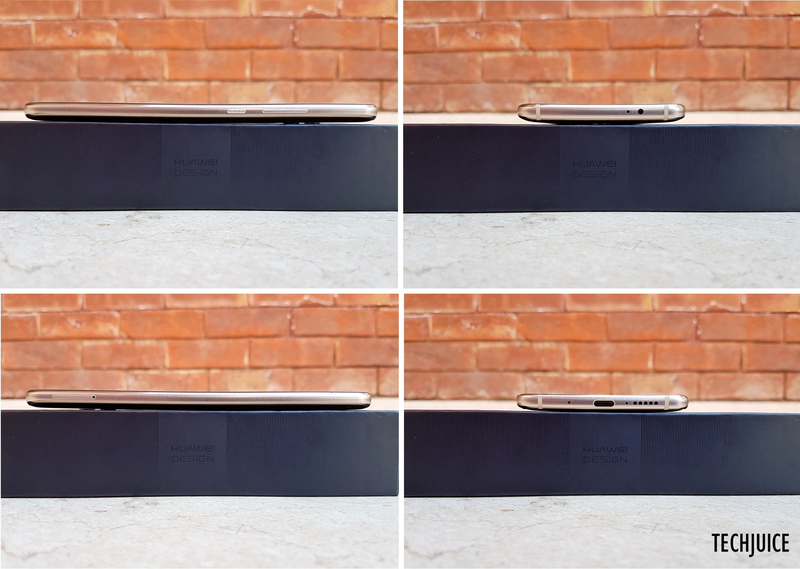 The new and taller screen resolution has had some adverse affect on the software experience too. 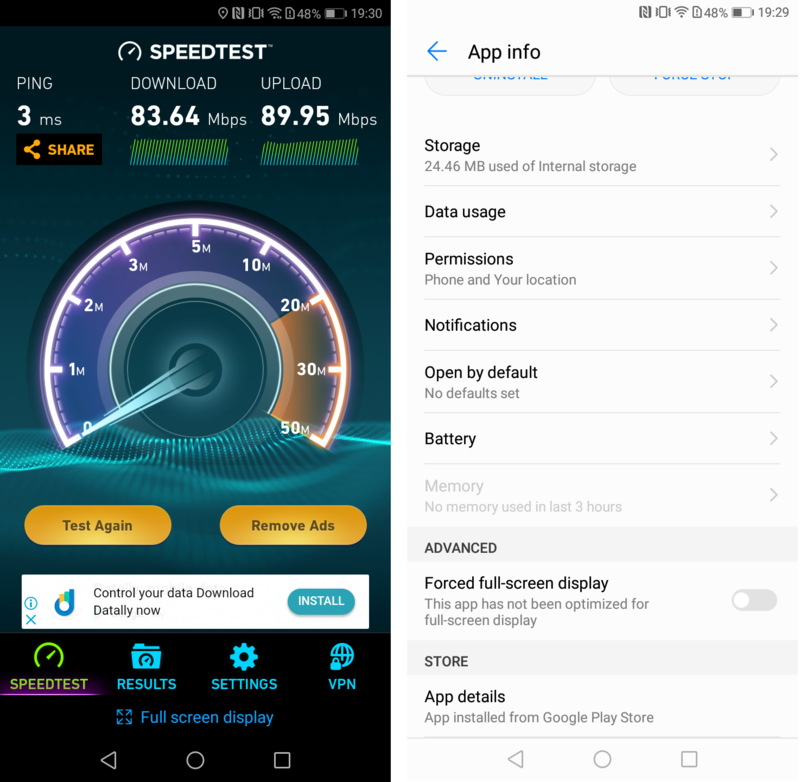 Some of the un-optimized applications run in a narrower frame until they are either updated by the developer to support the new resolution or you force the operating system to stretch them and fill the whole screen. This issue is present in a number of applications and games. In my experience, most of the time, ‘forced full-screen display’ option worked fine with most applications. However, the mileage may vary depending on the type of application being used. Huawei has equipped the Mate 10 Pro with their latest top of the line HiSilicon Kirin 970 processor. With 8 cores and a dedicated AI processing unit, the new flagship chip by the Chinese manufacturers was always expected to be a top performer. Huawei Mate 10 Pro meets all the expectations and is lightning fast in every aspect. It cruises through every thing you can possibly throw at it. You can easily play high end 3D games on the Mali-G72 MP12 GPU included on the chipset. Huawei Mate 10 Pro has a 4,000 mAh battery which should, on paper, easily last a day and a half with heavy to moderate usage. 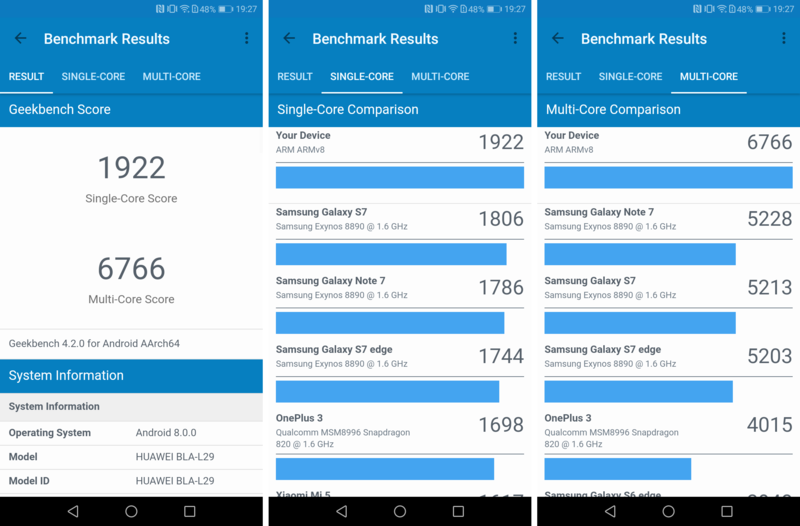 As was the case with performance, Mate 10 Pro does not disappoint in this area too. With light to moderate social media usage, playing a few games for half an hour, streaming videos and listening to music, I did not even come close to draining the battery in a single day. During my two weeks of usage, I rarely had to charge the phone at the end of the day. 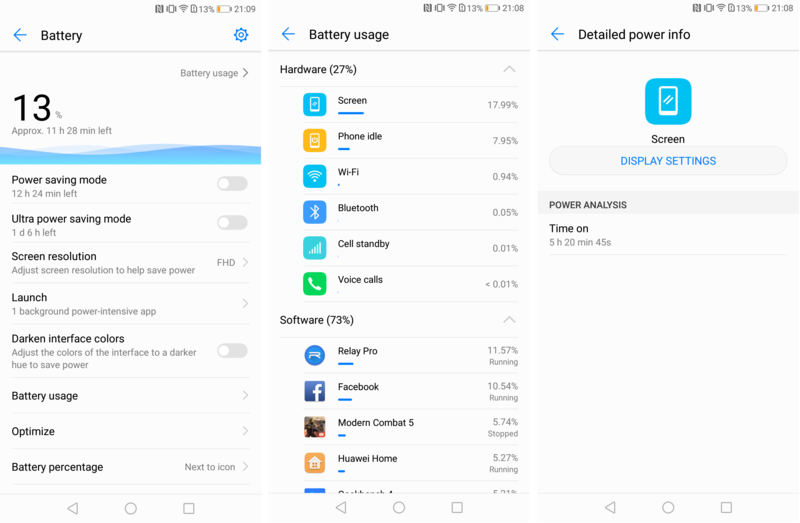 I always finished with 30-40 percent battery at the end of each day while using Mate 10 Pro. The screen on time was also within the range of 5-6 hours consistently. Note: Screen on time is not an absolute measure of battery life as it varies a lot based on the type of usage. Huawei Mate 10 Pro, similar to most flagship phones coming out in 2017, has a dual camera setup in the back. Using the dual 12 and 20 MP camera sensors with a f/1.6 aperture on the back, it can capture some amazing looking shots. Huawei also promises a 2x lossless zoom using the dual camera setup and I didn’t find any evidence to refute that claim. It works great most of the time. There is optical image stabilization in the main camera while the 20 MP camera is used to further enhance the pictures and also calculate the depth for ‘portrait mode’. The ‘portrait mode’, or more commonly known as bokeh effect, works pretty well with the dual camera setup. As long as the subject is standing at an appropriate distance and there’s enough contrast between the object and the background, the portrait mode simply works. 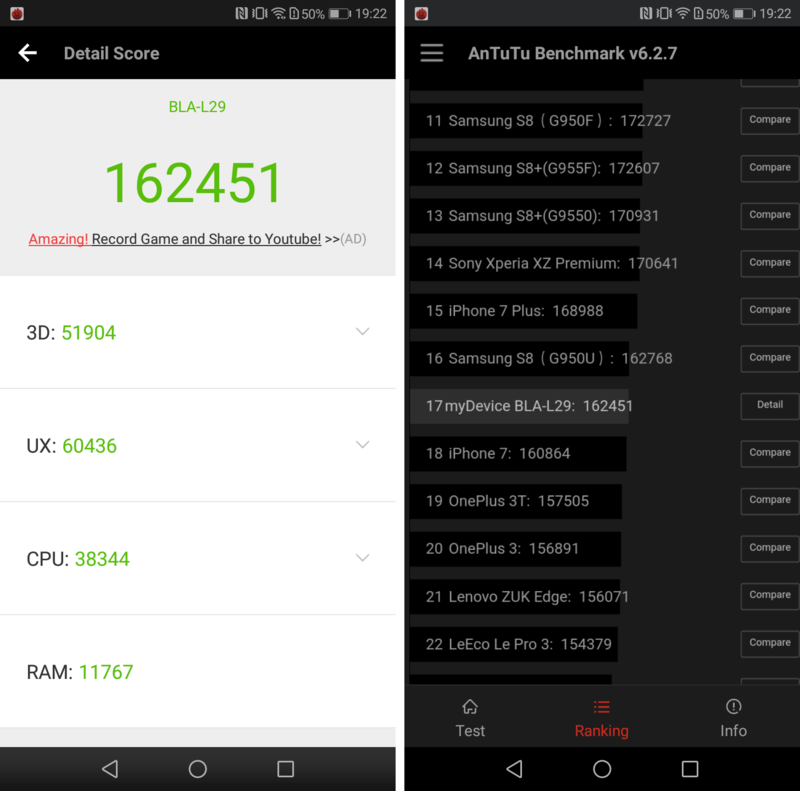 Huawei Mate 10 Pro makes use of the dedicated AI chip in an interesting manner. Using the chip for real-time image processing, it detects the objects that camera is pointing to and adjusts its settings accordingly. For example, if you point the camera towards any food item, it will change the settings automatically to suit a close up image of a food item. Currently, it can detect 13 different objects and scenes at the moment and surely more will come with future updates. The front camera has an 8 MP sensor with f/2.0 aperture. 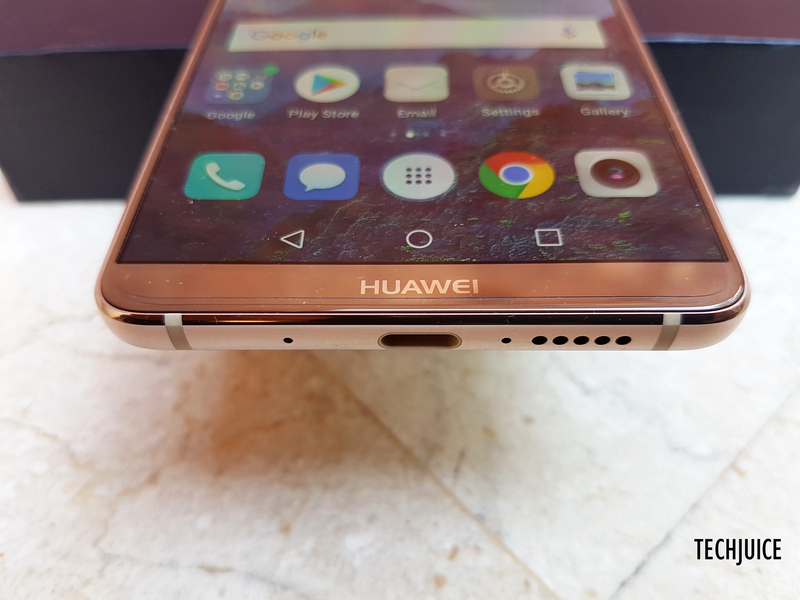 Huawei has previously used dual front cameras on its phones and it was a little disappointing to see the flagship phone missing out on that unique feature. Although there aren’t any fancy dual cameras on the front, it still didn’t stop Huawei from offering a portrait mode while using the front camera. Using the dedicated AI chip and some post-processing magic, selfies taken from the front camera can also get the ‘portrait mode’ treatment. 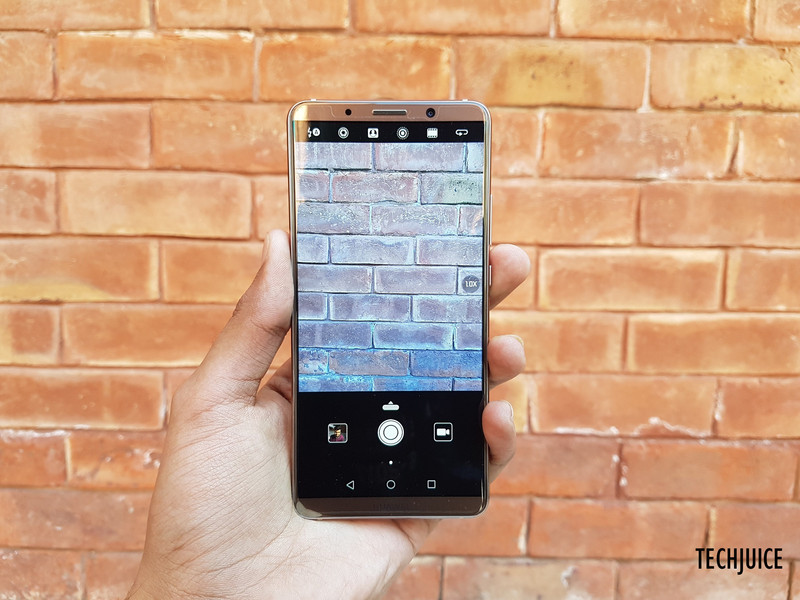 Overall, Huawei Mate 10 Pro offers an excellent camera experience and most users should be more than happy while taking its camera for a spin. Huawei was previously known for making excellent mid-range and budget phones. It gained a lot of market share by providing excellent features and an outstanding price to performance ratio as compared to other competitors. 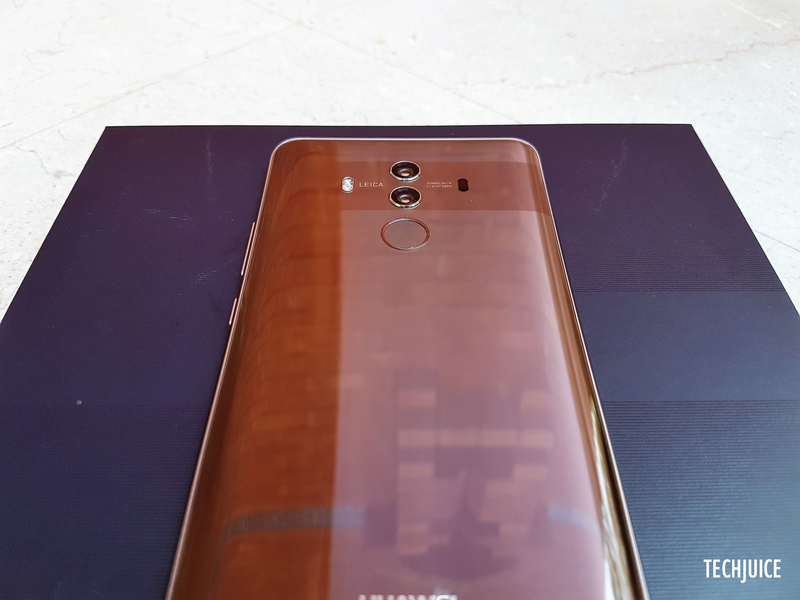 But with the last few generations of Huawei’s flagship Mate phones, it has emerged as a serious contender for a spot in premium phone manufacturers’ category. 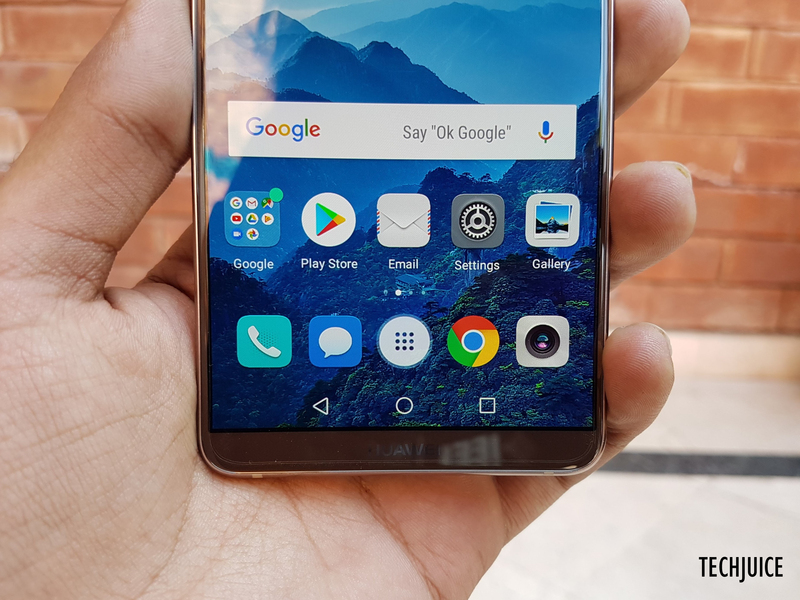 With an excellent screen, amazing battery life, outstanding performance and eye-catching design, Huawei Mate 10 Pro is all set to give other flagship phones a run for their money. 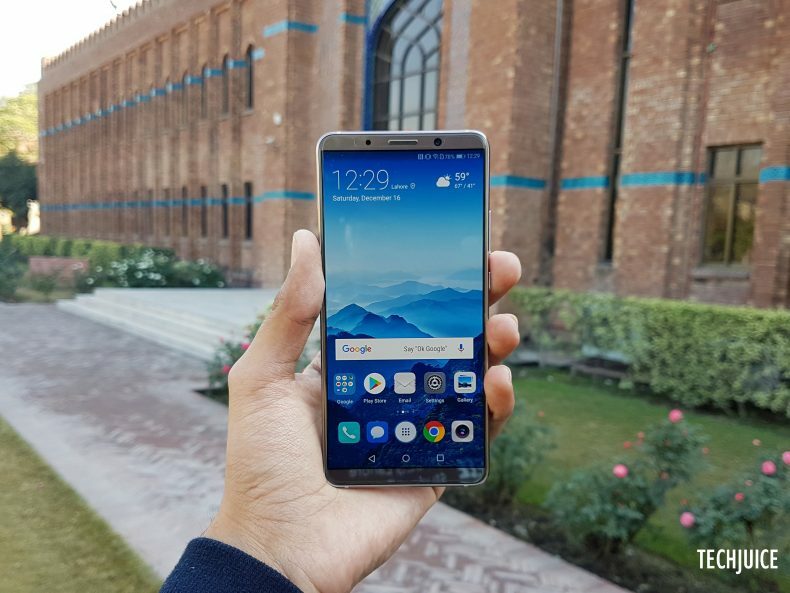 If you don’t mind the removal of the headphone jack, have no trouble handling larger phones, and are prepared to spill out 87,999 Pakistani Rupees for your next phone, Huawei Mate 10 Pro might be the phone you are looking for.